“Accompanied by Mr. Moneybags … we [enter] into the hidden abode of production, on whose threshold there stares us in the face ‘No admittance except on business’. Here we shall see, not only how capital produces, but how capital is produced. We shall at last force the secret of profit making.” – Karl Marx, Capital, Vol 1, Chapter 6. On February 21, 2016 a rare but much-needed Anti-Privatization Forum is being held in Toronto. The event not only continues a decades-long struggle by unions, activists, and concerned citizens to protect public services; it identifies areas of particular relevance in Ontario’s privatization saga today – namely in relation to healthcare, hydro, transit, and housing. If Canada’s late 1980s and early 1990s privatization schemes largely favoured creating new sources of private profit making through the divestiture of state assets, by the late 1990s new avenues of privatization were being increasingly located within the state in the form of public-private partnerships (P3s). While public-private collaboration may be nothing new in Canada, P3s for public infrastructure and services establish binding, multi-decade long contracts that bundle the private for-profit design, construction, finance, and management of public works that remain state responsibilities. With these partnerships, the state remains on the hook and the privatization dimension often flies under the radar. Seldom is any effort by P3 promoters put into making the public-at-large aware of what exactly P3s are, how they are produced, and how they work as a hidden abode of profit making within public sector operations. This despite many an Ontario P3 being a household name: Highway 407, the Brampton Civic Hospital, the Thunder Bay and Waterloo courthouses, and several up-and-coming LRT projects in Toronto, like Finch West and Eglinton Crosstown, just to name a few. There are now well over 200 infrastructure P3s across Canada in nearly all jurisdictions, in some of the most sensitive areas of the public interest: healthcare, education, water, transportation, and incarceration. They turn public infrastructure and services into private commodities and financial assets with shockingly few details released except when admitted on business. Opacity results in P3 proliferation and normalization despite serious drawbacks like incursions on democratic processes, urban planning, social justice, environmental protection, and labour conditions. “Infrastructure is ultra-low-risk because competition is limited by a host of forces that make it difficult to build, say, a rival toll road. With captive customers, the cash flows are virtually guaranteed. The only major variables are the initial prices paid, the amount of debt used for financing, and the pace and magnitude of toll hikes – easy things for Wall Street to model” (Emily Thornton, Businessweek , 2007). Idiosyncrasies aside, a P3’s profit-oriented private partners are made up of two groups: equity investors who are signatories to the contract (typically the engineering, construction, and service providers), and debt holders who provide the bank or bond financing (which can include private commercial banks, wealthy individuals investing in infrastructure funds, and institutional investors like pension funds, life insurance companies, sovereign wealth funds and superannuation funds, and investment banks). Privately financed public infrastructure offers investors two means of profit making: as projects and as assets. Physical infrastructure projects like bridges, highways, and water treatment facilities provide stable and predictable revenue since they monopolize the role of provider and deliverer of that service to particular communities. The monopoly position is then guaranteed by multi-decade government contracts that often contain anti-competition clauses. And as a financial asset, public infrastructure brings in high returns for low risk. Mark Florian, the head of North American infrastructure banking at Goldman Sachs, summarizes the eagerness of investors to have government set up and lock in P3 projects: “there’s a lot of value trapped in public assets” (quoted in Thornton 2007). Though each project is unique, investors tend to expect real rates of return of at least 15-25%; if refinanced in the relatively low risk operational phase of the project, cheaper debt can mean significantly enhanced profitability for equity holders. In some jurisdictions (such as Ontario and BC) refinancing gains must be shared with public partners, in others this provision does not exist. Equity sales can also be quite lucrative. In the UK, for example, Whitfield (2011) estimates that 240 P3 equity transactions have taken place since 1992, valued at £10-billion, with average profit rates coming in at a whopping 51%. Equity sales without public input or permission are typical in Canada. It is clear that one half of the P3 partnership gains substantially from privatization, but the implications are far less rosy for the public and public sector. In December 2014, Ontario’s Auditor General concluded that 74 P3 projects had added an additional (and unnecessary) $8-billion to the province’s long run budget obligations when compared with what traditional ways of financing, building, and procuring infrastructure would have cost. Most often this comes down to the lower rates of interest paid by public borrowers (even/especially after 2008) but can also be chalked up to the higher transaction costs associated with P3s. Despite the provincial interest rate favouring public borrowing, the province of Ontario defends its use of private financing on the basis that it cannot sustain a high amount of debt. This argument obscures the long run nature of the P3 commitment: whether direct borrowing or multi-decade payment obligations to a private partner, the least costly option is the public option. It turns out that for Ontario and the rest of Canada, in most cases the entire VfM basis of choosing a P3 over the traditional model rests on the claim that it uniquely provides for ‘risk transfer’. The argument is twofold: that P3s insulate the public from unnecessary and unexpected costs and that by linking private partner compensation to the acceptance of risk there will be an incentive to find project efficiencies and ensure quality delivery. In this sense, P3 is an insurance policy taken out (and paid for) by the public sector. Arguments such as these ignore the longstanding practice of transferring risks through traditional forms of procurement. Auditors General in Ontario (2008) and Quebec (2009) have openly questioned P3 for this reason alone. Risk transfer justifications also privilege the P3 model without any basis in fact or systematic study of public sector performance. Infrastructure Ontario assumes that the risks associated with fully public projects are 5 times greater than with P3 but the provincial Auditor General argues “there is no empirical data supporting the key assumptions used by infrastructure Ontario to assign costs to specific risks” (2014, 198). For all their drawbacks, P3s work quite well in other ways, namely at accomplishing accumulation by dispossession. We now see not only the entrenchment of design-build-finance-operate infrastructure P3s in Canada but also its evolution and spread into new territory. The return of austerity after 2009 has only contributed to the shape-shifting nature of P3. Looking at examples of cutting-edge trends in P3 from the U.S., UK, and Australia indicates what might be soon in store for Canadians. Countering the P3 push has thus far proven difficult. Despite spectacular project failures, the demonstration effect has done little to reverse P3 use. Union resistance has been somewhat successful, in a limited way – in areas like Ontario’s health sector, P3 hospital service contracts are now narrower but P3 hospitals are more prevalent than ever. Planning and spending frameworks and oversight by auditors may be helpful at improving the process of P3 but cannot help intrinsic problems with the outcome of P3. If a solution is to be found which is of broad appeal – those tacit supporters of privatization included – it will be most successful if focused on the cost and financing dimensions. Calgary, for example, cancelled its P3 schools program in 2014 on the grounds that it was cheaper to use the traditional public route. Arguments in favour of using private financing vary between it being a way to capture ‘extra’ money or a way to ‘replace’ public spending but the reality is that private financing through the P3 model must be paid back either through government-owed availability payments (taxpayer compensation sent to the private partner for its services, e.g., hospital cleaning) or by the public directly through user fees (collected at the time of use, e.g., highway tolls). Repayment schemes make P3 a mechanism of infrastructure financing, not funding – funds for public infrastructure ultimately come from taxpayers or service users one way or another. Heather Whiteside is Assistant Professor of Political Science at the University of Waterloo and Fellow at the Balsillie School of International Affairs. Auditor General of Ontario. 2014. “Infrastructure Ontario – Alternative Financing and Procurement.” Annual Report for the Auditor General of Ontario . Auditor General of Ontario. 2008. “Brampton civic hospital Public-Private Partnership Project.” 2008 Annual Report of the Auditor General of Ontario . Auditor General of Quebec. 2009. Rapport à l’Assemblée nationale pour l’année 2009-2010 . Marx, Karl. 1976. Capital . Vol. I., Vintage: NY. Thornton, Emily. 2007. “Road to Riches.” Bloomberg Businessweek . May 6. Whiteside, Heather. forthcoming 2016 (in press) About Canada: Public-Private Partnerships . Fernwood Publishing: Winnipeg and Halifax. Whiteside, Heather. 2015. 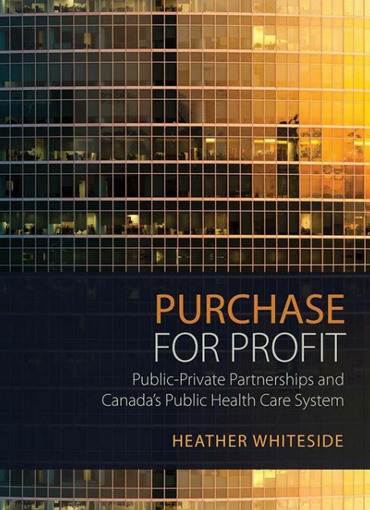 Purchase for Profit: public-private partnerships and Canada’s public health care system . University of Toronto Press: Toronto. Whiteside, Heather. 2014. “Tarnished yet tenacious: examining the track record and future of public-private partnership hospitals in Canada.” In Atasoy, Y., ed. Global Economic Crisis and the Politics of Diversity . Palgrave Macmillan: London. Whitfield, Dexter. 2011. The £10bn Sale of Shares in PPP Companies: New Source of Profits for Builders and Banks . European Services Strategy Unit. Justin Panos: The Ontario Liberals and Long-Term Care (18 February 2016). Ontario Health Coalition: Against Privatization (5 February 2016). John Lister interviewed by Robin Chang: Public Healthcare Against Privatization (21 August 2015). Brenda Thompson: Rapid Transit Rip-Off (28 January 2015). Herman Rosenfeld: The New Struggle for Public Transit (9 April 2014). Brenda Thompson: Privatization and Public Transit in Toronto (18 February 2013). Paul Kahnert and Sam Gindin: Tax Cuts, Privatization and Deregulation Disguised as Public Policy (20 January 2012). Doug Allan: The Coming Battle: Healthcare Privatization and the Ontario Election (5 October 2011). John Loxley: Global Crisis, Fiscal Restraint and Public-Private Partnerships (10 March 2011). Paul Kahnert: The Case For Keeping Our Hydro Utilities Public (2 March 2010).